Home » Blog » Sore Neck? The deep neck flexors are the muscles on the front of your neck that stabilise the cervical spine, ensuring an appropriately aligned posture. These muscles attach along your cervical spine, as well as onto your upper ribs and vertebral bodies. They assist in drawing your chin back towards your throat, which maintains a neutral cervical spine alignment. These muscles are integral in avoiding a sore neck. Weakness in these muscles leads to the common ‘poke-neck’ posture in which your neck extends whilst your chin pokes forward. This puts considerable compression on the muscular, ligamentous and nervous (nerves) structures on the back of your neck leading to muscle spasm, tightness, headaches and an extremely sore neck. A graded strengthening program of your deep neck flexors utilising a biofeedback pressure pad improves your resting posture. Physiotherapy assessment is essential to individualise a program specifically for you – however, this is the basic premise protocol. Evidence shows that patients with chronic neck pain who underwent deep neck flexor activation found effective pain alleviation, improved function and corrected forward head posture. Test and training performed in supine. Place the inflatable cuff inflated to a baseline 20mmHg under the crook of the neck to fill the space between the neck and the plinth. Hold onto the pressure gauge, with clear view of its reading. View set up here. The purpose is not strength but precision. Gently and slowly nod the head by tucking your chin back down towards your throat. 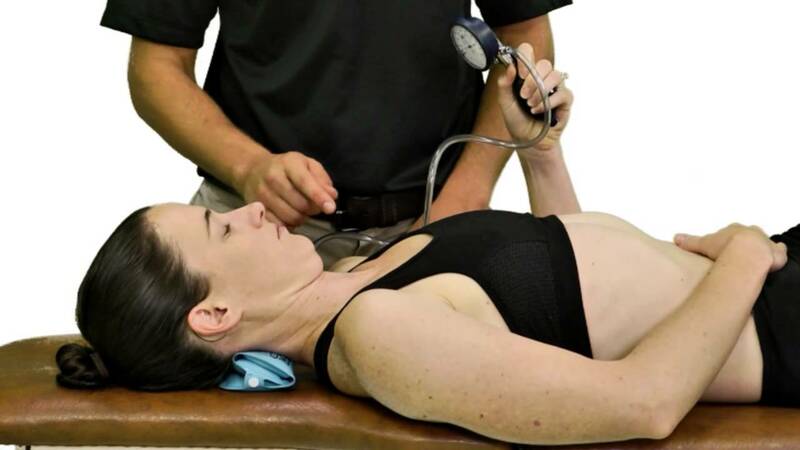 Monitor sternocleidomastoid (SCM) activation (thick muscle on either side of your neck) – this has to be relaxed! Aim to hold 22mmHg for 5 seconds. If able to perform, continue to increase pressure by 2mmHg increments for a 5 sec hold. A failed level is when it cannot be maintained for the 5 seconds or if SCM is activating. Go back down one level (minus 2mmHg) from the failed level, this is your level. Aim to hold at that level for 10 seconds for 10 repetitions. The final goal is 30mmHg for 10 seconds x 10 reps. The training and strengthening of these muscles ensures the chin does not poke forwards, reducing upper cervical extension. This de-loads the structures of the posterior neck, thus assisting in relief from your chronic pain and symptoms.